"Once again, Toscanini provided the initial boost to propel a young singer on her way. [Toscanini] simply liked her warm musical manner and the appealing smoky sound of [Merriman's] mezzo-soprano. 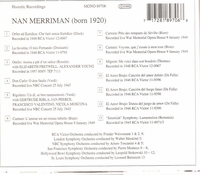 In fact, Toscanini used Merriman in more NBC broadcasts than any American singer other than Jan Peerce. The incisive attack, throbbing vibrancy, and wide expressive range of her voice were probably heard to best advantage in the song literature. EMI recorded her in two LP discs of French and Spanish music during the mid-fifties, records that never lasted long in the commercial catalogues but soon became collectors' items among vocal connoisseurs. Presumably satisfied with a quiet yet fulfilling career, Merriman retired in 1965, her voice and artistry still in peak condition."